Turkmenistan is a Central Asian country on the Caspian Sea bordering Kazakhstan, Uzbekistan, Iran, and Afghanistan. The country prides large natural gas reserves and has been an important crossroad historically. All visitors to Turkmenistan staying longer than five days must obtain a visa. The cost of the visa varies depending on country of origin. People visiting Turkmenistan for touristic purposes should purchase their air tickets through a registered travel agency, as the agencies are able to communicate with the Turkmenistan government for visa application purposes. Visas for Turkmenistan will only be granted to people who have tickets to travel with an official guide. Visas may be purchased on arrival at Ashgabat airport but prior approval must have been granted by the Turkmenistan authorities. It is not recommended to try to book a ticket without also arranging for a visa. Passports must be valid for six months from the date of visa expiry. Travelers who are staying for more than three days should register their presence in Turkmenistan with the State Service of Turkmenistan for the Registration of Foreign Nationals. There are no limits on the import of foreign currency to Turkmenistan. Importing certain plants and medicines requires a permit. Additionally, dogs and cats must have a certificate of good health. Passengers are allowed to bring without customs duty 2 liters of any alcoholic beverage for persons over 21 years of age, 200 individual cigarettes or 200 grams of tobacco for persons over 16 years of age, and personal belongings up to a reasonable value. I work in Istanbul as an English teacher and wanted to spend some time traveling during my summer break. I chose a ticket to Turkmenistan because I like Central Asia and it was one of the few countries in the region that I haven't seen yet. I bought an air ticket to Turkmenistan through a registered travel agency, and they took care of everything - visas, foreigner registration, a guide for the duration of our stay, all accommodations, and even food. I flew with Turkish Airlines to Turkmenistan at a good ticket price, especially considering how comfortable the flight was! The food on board was excellent (I often choose an air ticket on Turkish Airlines over other carriers because of the food). Turkmenistan is definitely off the beaten tourist path and there were many ancient sites that I would have never seen otherwise had I not bought that air ticket! Flying with Turkmenistan Airline, the Falcon! For my two-week trip to Turkmenistan earlier this year, I bought an air ticket on Turkmenistan Airlines, the national carrier, so I could experience a new airline. It had a falcon for its logo, and the new, beautiful Ashgabat airport is shaped like a falcon! It has a huge passenger capacity but the flight was not so crowded. I was able to enjoy the airport and browse the shops, including traditional handicrafts from Turkmenistan. The Turkmenistan Airlines staff were very courteous and happy to assist passengers, and the plane was very comfortable. The flight concluded my very pleasant experience in Turkmenistan and I'm glad I chose Turkmenistan Airline! Q. What is the culture of Turkmenistan like? A. The official language of Turkmenistan is Turkmen, which is closely related to Turkish and Azerbaijani. However, many people in Turkmenistan speak Russian in addition to Turkmen. After buying your air ticket you should learn some key phrases in Turkmen and Russian as it will help you during your travel in Turkmenistan. You should also look up traditional music and other cultural activities in Turkmenistan. When you are looking to buy gifts before your returning flight, consider getting a traditional Turkmen carpet. Buying from an official shop backed by the government will take care of all export issues, so you can happily board your flight! Q. What activities are recommended in Turkmenistan? A. One of the most famous sites in Turkmenistan is "Door to Hell", a giant open pit of natural gas that has been burning continuously for forty years. While it may not be the only reason to visit Turkmenistan, it is still an interesting location and definitely worth a visit. Other places to tour in Turkmenistan include Partisan Fortresses of Nisa, a UNESCO World Heritage, State Historical and Cultural Park "Ancient Merv", another UNESCO World Heritage, and Turkmen Carpet Museum. A visit to Turkmenistan opens up a large part of human history, so travelers interested in history should certainly buy a ticket! Q. When is the best season to visit Turkmenistan? A. Turkmenistan's climate is dry and windy, with summers that can be very hot (including the hottest temperature ever recorded in the Soviet Union) and winters that are cooler and slightly more humid. The best times for you to visit Turkmenistan are early summer (April to May) or autumn (September to October). In general, air tickets will be less expensive at this point as summer is peak travel season, so buying an air ticket in the fall will also allow you to perhaps spend some time stopping at the layover points along your ticket route. Turkmenistan has a national flag carrier, Turkmenistan Airlines, which sells air tickets for direct flights to Turkmenistan from many points of origin including Turkey, Thailand, India, Kazakhstan, and Russia. Other carriers are also available from Turkey, Azerbaijan and the United Arab Emirates. For travelers departing from Europe or North America, flights transiting through Turkey are most accessible. Passengers can choose between Turkmenistan Airlines or Turkish Airlines. 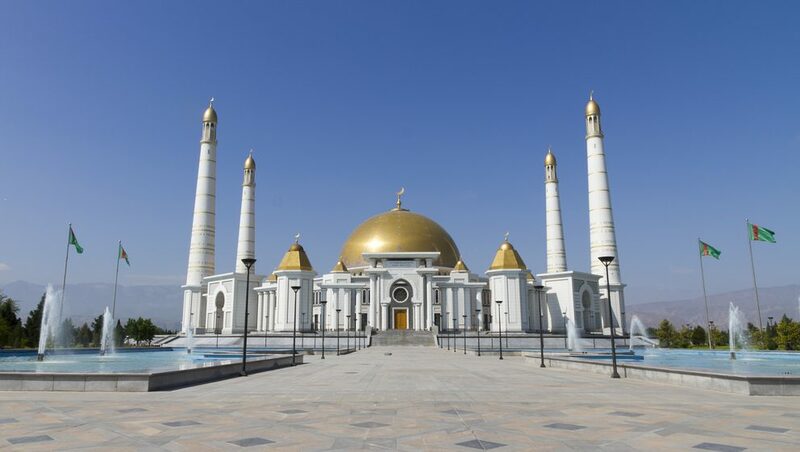 Most international flights to Turkmenistan arrives at Ashgabat International Airport (ASB), although there are some flights available to Turkmenbashi International Airport (KRW).